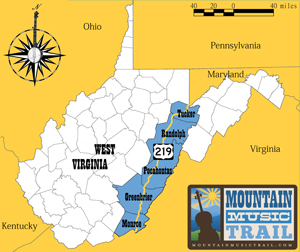 The Mountain Music Trail connects a potpourri of music venues, festivals, musicians, radio stations, music groups and people devoted to preserving and playing West Virginia’s old time music. The Mountain Music Trail connects a potpourri of music venues, festivals, musicians, radio stations, music groups and people devoted to preserving and playing West Virginia’s old time music. It follows 200 miles of route 219, also known as the Seneca Trail, the backbone of the Allegheny Mountains. Attractions span from music hot spots to dances to pickin’ jam sessions to big festivals and everything in between. Travelers will discover traditional music from bluegrass to Irish, classic country, folk, Celtic and gospel. The sounds and beats are a sharing of living music history, with younger people picking up the forms passed down for generations and evolving it into their own. Meet the Hammons family, still playing the same ancient forms they’ve championed for generations. Embodying the vitality of this ancient music is Trevor Hammons, an 8th grader whose grandfather’s music was documented by the Smithsonian in the 1970s. Trevor picked up a banjo in his “youth” and is a fantastic player in his own right. His group, The Young and Restless Pickers, plays weekly on the trail. Trail stops in Greenbrier County include one of only four Carnegie Halls worldwide still in continuous use. This Georgian revival structure has played host to a variety of genres for nearly a century. Then there’s the local coffee house, the Wild Bean and Irish Pub on Washington Street, community gathering spaces for meeting friends new and old. Travelers looking to follow the trail and join the celebration can find a handy map and calendar of events at MountainMusicTrail.com. For your listening pleasure, the Front Porch Music cd, includes a selection of old-time and bluegrass tunes straight off the Mountain Music Trail.